Today I want to talk to you about a unique home based business opportunity that I discovered a number of years ago (after a lot of prayer and research) that has been a real blessing to me and my husband. As many of you know, we have been serving as missionaries in Australia since 1997. Like most missionaries, we raised support from wonderful churches of like faith in America and that income met our financial needs in Australia for several years. Of course, as time passed the rising cost of living and the fluctuations in the value of the US dollar made it more and more challenging to live on the amount of support we raised more than a decade previously. I began looking for solutions and eventually discovered a unique home based business opportunity that I could work on in my spare time anywhere in the world, which was ideal for me. A few years ago, the global financial crisis reached nearly every corner of the planet with negative effects on the lives of so many people. Perhaps you were one of them. During any large scale financial crisis, big corporations fail, unemployment rises, and those planning for a happy retirement have to go on working far longer than they had anticipated. So, what can you do to reduce the negative effects of any current or future personal financial crisis that you face individually? Many experts will advise you to start your own unique home based business. 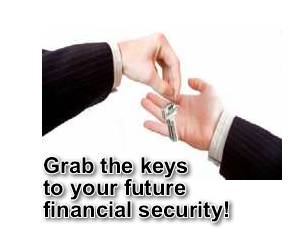 It's not a bad idea if you can find one that can potentially eliminate your financial worries about the future. Often people imagine a lot of obstacles that would keep them from being able to start a home business. Obstacles like a lack of start-up funds, a lack of skill, or even a lack of potential customers in their regional location. All of these fears can be easily overcome with the opportunities that are now available through online marketing. This is the unique home based business opportunity that allowed me to use my own interests and knowledge to help supplement our mission support income. Starting a home based business that leverages the awesome power of the internet is something more and more people are undertaking as they seek to generate extra income and to relieve the the constant anxiety about being fired or laid off from their jobs. It might seem impractical to even think about starting a new home business in these times when most families are desperately fighting to reach the end of the month. Here is an idea to get you thinking how it's not as hard as you might think. That doesn't require a large investment. You don't have to develop any kind of products or services. No need to take and process a single order. You don't have to handle or ship a product or service. You will never have to answer customers e-mail. This business can be started part-time. While you can offer products and services of your own for sale, it really isn't a must if that isn't your thing. I'm personally in a position that makes that type of business impractical. Instead of selling your own products or services, you can build a business using knowledge about what you know and love. Want a quick example? Let's say you know a lot about rose gardening. You can create a website based on that theme, filled with in-demand, profitable topics related to growing roses. Build a website? You? Yes, you really can. It is not difficult when you have the right tools and resources at your fingertips. I had absolutely zero website building experience and very little internet knowledge. I could basically send emails and that's about it. You may say, there are billions of websites! How is this a unique home based business opportunity? Above and beyond the uniqueness of the program I discovered and use myself, what really makes this opportunity unique is YOU. What you bring to the table is your own unique personality, knowledge, and interests. Site Build It! 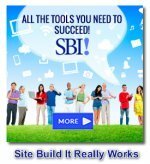 (SBI) enables you to use those things to successfully create your own website business. Site Build It! guides you through every step of the way... it even does many of the steps for you, automatically, saving you weeks of work. Soon, your rose-gardening content site will be attracting lots of targeted visitors, folks looking for exactly what you are offering. Your site pre-sells through its high-value content. Your in-context text links refer them to books, garden suppliers, rose breeders, and other related merchants with whom you are affiliated. If they follow these links and make a purchase, you get a commission on the sale - over and over again! Advertising on your site by using Google Adsense or other forms of advertising is also very common and easy to implement. All this implies income for you. Good income. Because your referrals buy and click. That's why I guarantee that Site Build It! "builds income through content." Simply follow the proven Action Guide (video and written versions for your convenience) to success. The AG guides you successfully through the complete process, using easy-to-follow language and illustrations. By the end of the process, you will have a Theme-Based Content Site up and running, and increasing your income. Build a business where you are in control, following a step-by-step plan and using tools with a proven track record of success within a positive, forward-thinking, and supportive community. It my opinion, it's the absolute BEST way to overcome the residual effects of the global financial crisis and help secure your financial future. Take a moment to download this free Affiliate Master Course. This course is an intensive 10 Day itinerary on what's involved in turning your knowledge, hobby, or special interest into a successful affiliate website business. Right click and save it on your desktop to read. You will need Acrobat Reader to read it. Get a free copy here! Many people who were affected by the financial crisis 2008 used the Solo Build It program to generate an additional income in their spare time from home. I just happen to be one of them. Will you be the next person to take advantage of this unique home based business opportunity? I wish you all the best!